Jatoba, also known as Brazilian cherry, is the most sought after exotic wood species. It is grown deep in Amazon forest in Brazil and harvested with strict certification guidelines. 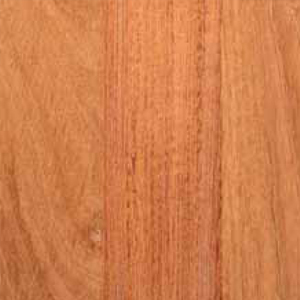 The sapwood of Jatoba can be a white, gray or pinkish tone. The heartwood ranges from a salmon to orange brown when it is freshly cut. However, once exposed to air and light, Jatoba richens and darkens in color to give you an incredible warm and rich exotic floor. It will eventually darken to a deeper russet red marked with dark brown streaks. Jatoba’s outstanding hardness and density, together with its beautiful color make it the perfect flooring choice. 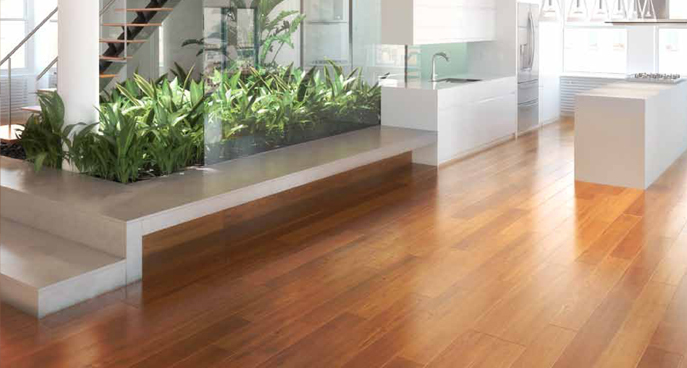 Jatoba flooring is highly prized for its dramatic and breathtaking exotic appeal. Grain: Often interlocked with a medium to coarse texture. Has an interwoven grain. An overall golden luster adds depth to overall deep red hardwood. Hardness: 2350 Janka Hardness Scale, almost twice as hard as red oak. Durability: The heartwood is orange brown to a deep red with a sharply demarcated grayish yellow sap. Widths: Available in solid planks only 2 ¼”, 3 ¼”, 4”, 5”.